I am beginning Shiller Math with my 3rd child. My son, who is a natural with math, has done great with Shiller and is in Book 4. My daughter, who claims to hate math, has done well with a little supplementing. (Now that she completed Book 4 with flying colors, she is very proud and excited to start Fractions.) My youngest will begin Book 1 in the near future. I recommend Shiller for its hands-on approach, simple lessons, ease of use, and strength in teaching math concepts. *Arranged in simple lessons. Can easily do as many as your time and child's attention span allow. Concepts are introduced in bite-sized pieces and built upon. *Little/no prep time. A few manipulatives may be needed. *Very "mom-friendly" telling what to say and how to guide your child to the right conclusion. Just open the book to the next lesson and get started. *Strong in teaching arithmetic, place value, and general math concepts hands-on with manipulatives where kids can SEE the math before putting it on paper. *Strives to teach using games and investigations. *Have phone line set up for questions or more explanation. Someone always answers and helps. *Lessons can be downloaded to be repeated or so the books can be reused with another child. *Diagnostic tests show where there is a weakness and what lessons correlate to that area of the test. *Since rote learning is not the goal, memorization of facts is not pushed. Games are played to foster recall, but my daughter didn't apply it. As she progressed to harder arithmetic, her lack of memorized facts slowed her down and caused her to lose track of what she was doing.I actually began drill practice with her along with occasional 1 minute timed tests for practice. Leading up to multiplication we made up our own songs for skip counting; we also supplemented with Times Tales DVD for memorization once the concept of multiplication was understood (which Shiller does a great job in teaching). *The tests are LONG and cover a lot of information. We always review a day or two before so they can refresh their memory of earlier lessons; we divide the test in half so they have a break. *Long division is not taught thoroughly or to my liking. I taught it step by step on my own. I recommend Shiller for its hands-on approach, simple lessons, ease of use, and strength in teaching math concepts. The pros easily outweigh the cons. RE: Montessori-Based? by: Elliot I'm not real familiar with Montessori. Has something to do with pre-school, right? Exactly how does ShillerMath work? How is it different from other curr.? Maria Montessori was an educator (b. 1870) who worked with children through the 8th grade and developed a philosophy and methods that have benefited millions of children over the last 100 years. One major Montessori concept is that children are natural learners and will learn at and direct their own pace when provided with a respectful environment. Another is that new topics be exposed concretely using all the senses first, and only then more abstractly. ShillerMath allows children to work at their own pace but does provide scope and sequence and lesson scripting so that parents/educators do not need Montessori (or math) knowledge or training. 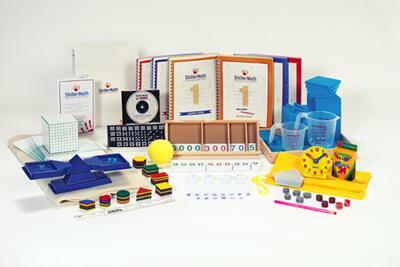 It also comes with a large set of manipulatives, an audio CD with 25 songs, answer guides, and free downloads of consumables. I'm not real familiar with Montessori. Has something to do with pre-school, right? Exactly how does ShillerMath work? How is it different from other curr. ?